Musical opportunities abound in OPS. We have three choirs: Junior Choir for P2-P3, P4 Choir and Senior Choir for P5-P7 children. 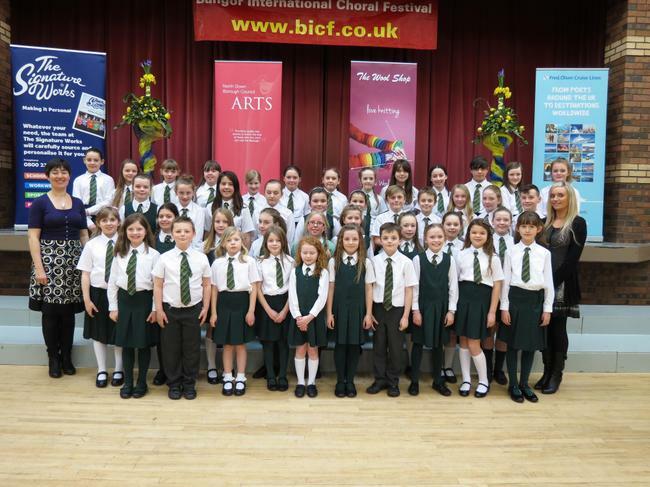 The senior choir participates regularly in local music festivals such as Mossgrove Youth Musical Festival and Bangor International Choral Festival. Last year in Bangor we came in second place in the hotly-contested sacred and own choice classes. In P4 children have the opportunity to learn a musical instrument. We have 85 P4-P7 pupils learning a range of instruments: violin; cello; flute; clarinet; trumpet; E flat horn; French horn; baritone, tuba; guitar, drums. After a year of instrumental tuition, pupils join the instrumental ensembles: strings group, concert band and orchestra. The school orchestra and ensembles play at the annual Carol Service at Orangefield Presbyterian Church as well as at our afternoon tea party in May. This summer event is famed throughout East Belfast for its informal atmosphere and high standard of music, where we showcase the best of our musical talent and have some fun along the way. Mr Cousley's guest appearance as 007 was a particular highlight! !